The clone tool is a great tool to use whenever you want to remove or add something to your digital image. Whether it is removing an unwanted person, or cleaning up the background, the clone tool is very handy is making small or big changes to your digital images. In Photoshop select your clone stamp tool. This is located along your toolbar, it looks like a rubber stamp. 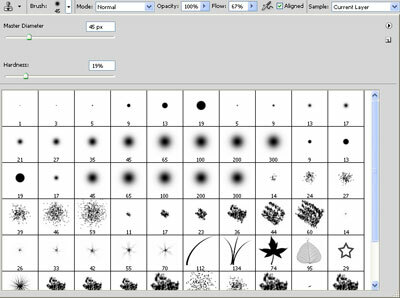 Select your brush type & size, this is located on your top toolbar. Once you click on the brush diameter a larger window will open up. This will give you a sliding bar to select your diameter and also allow you to pick your brush type. Your brush type can have softer edges or harder edges. The softer "fuzzy" edges will give you a softer line which makes blending a little easier. The size will determine the diameter of the cloning effect. You will most likely change the size of your brush depending on what you are trying to clone out. The smaller the area, the smaller the tip you will want to use. Cloning means that you replace pixels of your image with pixels from another part of your image, which is generally referred to as your "sample". First, you need to select your "sample". To do this you hold down the ALT key & click your mouse. You have now selected your sample for cloning. You will notice that when you hover over a section you will see your sample inside the brush tool. This will show you what it will look like when you clone over a specific spot. Just click with your mouse over the spot and you will have cloned over your unwanted section. You do not want to clone out large chunks at once, you will want to slowly work around the unwanted section. Take your sample as close to the unwanted section as possible. This will give you the closest coloring & lighting. If you clone a section & you don't like how it looks, just hit ALT+CTRL+Z to backup.